Darinka is an urban and housing specialist with over 17 years of international experience in research, teaching and consultancy. Her background combines Architecture, Sociology and Urban Planning, having been awarded a PhD from TU Delft (2014) for her research “Social Housing Organisations in England and the Netherlands: Between State, Market and Community”, an MSc in Regional and Urban Studies from the London School of Economics and Political Science (2002, with Distinction), and a BA in Sociology from the Pontificia Universidad Catolica de Chile (1998, First Class Honours). Darinka’s experience includes working as a research associate at the LSE Cities Programme (2002-2004); research director of the European Social Housing Observatory at CECODHAS Housing Europe (2005-2010); director of World Habitat (2013, formerly Building and Social Housing Foundation, BSHF) and as founder and managing director of DCConsulting in the UK (2013-2015). Darinka has advised and carried out research for a number of international bodies, including the European Commission, the European Investment Bank (EIB), the Council of Europe and Habitat for Humanity. After being awarded the Delft Technology Fellowship in 2014, she switched to a full time academic career. Her core areas of expertise are social housing and affordable housing in comparative international perspective; collective self-organisation in housing, housing (co)production and management; social enterprise and social innovation in housing, and urban social sustainability. In 2015 she co-founded the working group on Collaborative Housing at the European Network of Housing Research (ENHR), which she currently jointly co-ordinates with Dr Claire Carriou and Dr Richard Lang. Luz María Vergara is architect and MSc in architecture from Pontificia Universidad Católica, Chile. In 2018, she obtained her doctoral degree with the thesis ‘Managing Social Condominiums’. The research focused on the role of third sector organisations in supporting low-income homeowners to maintain and improve their own condominium housing. Luz María has worked as researcher, academic and independent consultant. Her research interests are related to the role of civil society organisations in vulnerable contexts, and specifically how societal requirements can be incorporated in housing design processes and management services through collaborative and bottom-up approaches. Currently, Luz María is a postdoctoral researcher at MBE department of TU Delft, and she works as a part-time researcher at Co-Lab research. Sara Brysch is an architect who holds a master’s degree in Architecture from Faculdade de Arquitectura da Universidade do Porto, Portugal. Her professional background includes working in Porto, Berlin and Mexico City, where she mainly focused on architectural design, management and construction supervision. Her research interests include affordable minimum housing solutions; “Existenzminimum” design approaches; collaborative processes in housing; and participatory design. Sara worked for a year as research assistant (part time) supporting Dr Darinka Czischke’s research on Co-Lab Research. She is currently a full time PhD researcher on ‘Existenzminimum in Collaborative Housing’, under the supervision of Prof Vincent Gruis and Dr Darinka Czischke. Carla Huisman is a sociologist who has studied the role of citizen participation in legitimising displacement, the precarisation of the Dutch rental housing market and the non-enforcement of regulations as a technique of governance. 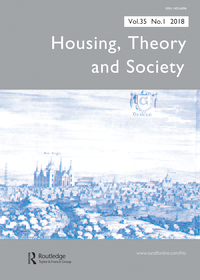 Broadly speaking, her research interest is the relation between housing policy and social-spatial inequality. She is currently finishing her PhD thesis entitled ‘Insecure Tenure’, under supervision of Prof. Dr. Mulder and Dr. Meijering at the University of Groningen. Carla currently works as post-doc researcher on the NWO-funded project Samen Wonen, Samen Onderzoeken under the supervision of Dr Darinka Czischke and Prof Vincent Gruis. Stephanie Zeulevoet works as a trainee architect at Inbo in Amsterdam. She graduated with a MSc Architecture from TU Delft in 2016 on the topic of cooperative housing. She is primarily interested in researching the potential for cooperative housing models to create affordable housing in cities in the Netherlands. Next to that, she works as a part time research assistant on the NWO-funded project Samen Wonen, Samen Onderzoeken led by Prof Vincent Gruis and Dr Darinka Czischke. We regularly host researchers from other universities who spend some months working with us in Delft. If you are interested in being a visiting scholar at Co-Lab Research send us a message. Dr Jasmine Palmer is Lecturer in Architecture and Sustainable Design at the University of South Australia (Adelaide). She completed her PhD on Multi-unit Collaborative Housing Provision in 2016 at the University of Adelaide. Currently, her research focuses on processes of land acquisition for collaborative housing and the impact on professional skills, roles and services. She has interests in housing policy and international policy transfer. During her period as visiting researcher at TU Delft, Jasmine expanded her research to include collaborative housing cases from The Netherlands and other European markets. As part of her PhD studies, which is about co-housing at the Danish Building Research Institute/Aalborg University and Kuben Management, Anna came to TU Delft to stay for some months in the spring 2017 with Darinka Czischke at the Department of Management in the Built Environment. The reason to choose TU Delft was that Darinka researches and coordinates the collaborative housing studies and the group ‘Collaborative Housing’ by the European Network of Housing Research, ENHR. Being part of the department for this periods has been productive: at the moment she is working on an article to publish, together with Darinka. Eva is an Associate Professor at the School of Architecture of the University of Málaga since 2010. Her stay in the Management in the Built Environment Department has allowed her to investigate the issues regarding empty housing spaces in the Netherlands, and to understand what research is being carried out from the academic field on this subject. She also had the opportunity to learn about concrete experiences, where citizens play an important role, and in which strategies for transforming and improving buildings and empty urban areas are being implemented, based on co-management between agents.